Visually here you see water scenes and colors of the rainbow stretching out. Both are important to me. I love to write within the sight, smell and sound of the ocean. I catch the pulse of the waves. I feel the pounding and sometimes the withdrawing of the surf. I walk the edge, search the horizon and bend to pick up treasures. The ebb and flow of the ocean has often been significant to me as I enter a lament mode and wish it could be “flow” all the time, and then finally relax into the “ebb” that comes with writing and that comes with living. Words tumble like salt spray. When I leave the beach, pieces of the ocean come with me—imprinted on my brain, embedded in my heart. So that wherever I am, I carry the ocean with me and I write. The colors of the rainbow are significant to me also—for in addition to their beauty, they convey inclusion—every color is in, no color is left out—they’re all there. That’s a significant piece of my faith: that everyone is “in,” nobody is excluded, and there are no exceptions. Historically the organized church has tried to make decisions about who is in and who is out—persons of color, women, persons of varying sexual orientations and gender identities. But the rainbow tells the truth—everyone is in! Join me in this adventure—explore the website—make your contribution to the blog—come back again and again. 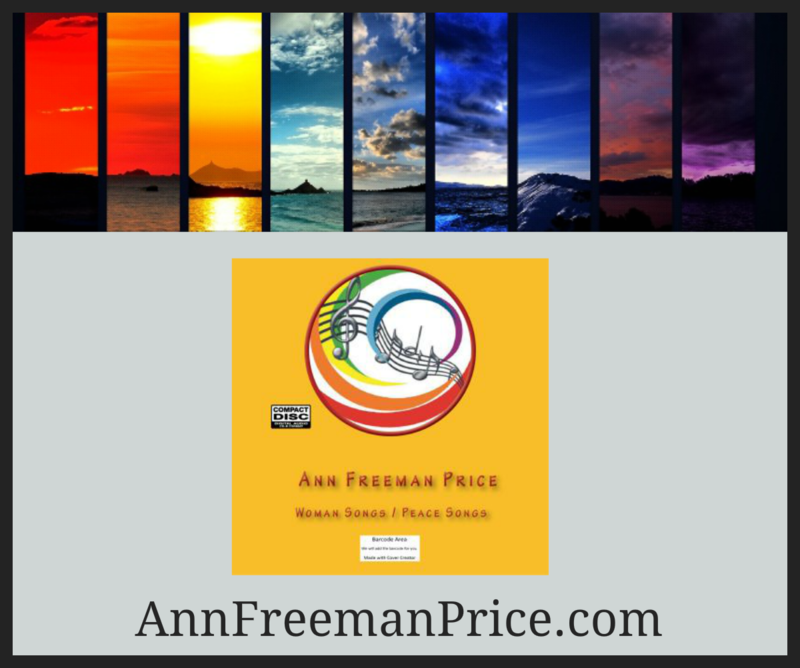 Here’s what is on the website: About Ann: there’s information about me and my writing and music; About Books: there is a description of my book “Trilogy of Cancer.”; About Music: There is information about my CD Womansongs-Peacesongs-and I Didn’t Know. There is a description of how I came to write each piece of music; Ordering: Information about ordering books and music; A Week of Prayers: every week I put on a prayer for each day; A Bunch of Books: each month I enter some books I have read that I recommend; Let’s “Talk” to each other: a blog where we can have a conversation. My hope is that this will be an interactive site—that you will go to these various places and then go to my blog and let me know your favorite prayer or the best book you have read lately—or just some thoughts you have had. Join me. I just re-read your piece in a 2006 Alive Now issue…”The Ways of Praise”. I loved how you worked in so many ways to praise God; Scripture, music, nature, and love. Just wanted to see if you were still active in your writing so many years later? Now that we know that the Alive Now printed version is not going forward, I treasure it even more and relish the gems within it’s pages.